I go through the punches, 4, 9, GROC, TOT — it’s more complicated than you think, and after you do it often enough, it begins to make a lttle song, that you hear words to, in my case “Hello (bing) there, you (gung) hap-py pee-pul (splat)”-the splat being the drawer flying out. Amazon Go, which represents Amazon’s third foray into the grocery space (after Amazon Fresh and Whole Foods), went live last week in Seattle. As its name suggests, its a smallish supermarket where customers simply “swipe in” with an Amazon QR code, pick up, say, a Chobani yogurt and some 365-brand chips, toss them into a purse, and then walk out — all without scanning items or interacting with a cashier (The Seattle Times has an excellent breakdown of how it all works). The shopper’s Amazon account is billed automatically. The magic of this frictionless shopping experience is thanks to a mix of computer vision and machine learning — about which Amazon is predictably tight-lipped. 1. Amazon ends up sticking with one Go store in Seattle/or closes it. Precedent: The Kindle Fire phone of 2014 was considered innovative and full-featured, but Amazon axed it after a few unsuccessful months. Barriers: It was hard to compete when the iPhone has been on the market for seven years, and the Kindle Fire had bells-and-whistles, rather than intrinsic product differentiation. But it’s not exactly the same case here. In fact, as I write this, I become even less convinced that Amazon will shutter Go. 2. Amazon begins to open up more Go stores nation-wide and/or installs the technology into the dozen or so pre-existing Amazon bookstore locations throughout the US. Precedent: Amazon has clearly shown an interest in physical retailing, at least on a limited scale, and it would likely not be particularly difficult to conduct a limited rollout in pre-existing locations. 3. 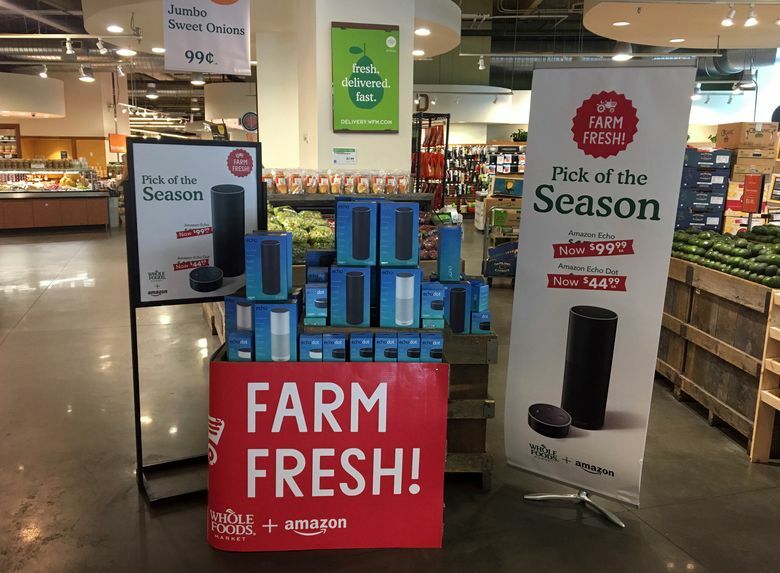 Amazon rolls the technology out in some or all Whole Foods locations. Precedent: Amazon has started selling the Kindle in Whole Foods (albeit somewhat in jest), and has offered certain Amazon items in store. It may be only a matter of time before Prime shoppers get discounts, or free Allegro coffee, or package pickup at WF locations. And the implementation of Amazon Go’s infrastructure might just be the next step. 4. Amazon continues to use and build Go, but licenses the tech and implementation to other firms, like Target and Walmart. Precedent: Here’s looking at you, AWS. Amazon Web Services began as a solution to an in-house problem, but has become an incredibly successful business in its own right, and powers the backend of sites like Netflix and the NSA. Amazon also does brisk business in its FBA (fulfilled by Amazon) division wherein it warehouses and ships items on behalf of sellers who list their items on Amazon. Barriers: Software is easier to license than hardware installations, and there’s effectively zero marginal cost. Also, if you were Amazon, would you really want to empower Costco to offer the same kind of spiffy shopping experience that you do? In sum, there are a lot of different an interesting directions here. If I had to put my money on one, it would be on option number 2 — a rollout of the technology into pre-existing Amazon stores — since it has the closest (recent) precedent, and wouldn’t involve negotiating new property leases, and the company could leverage pre-existing stores, personnel, and marketing. As a side note, the author Michael Ruhlman, who, in 2017, wrote a book called Grocery: The Buying and Selling of Food in America, almost seemed to presage Amazon’s purchase of Whole Foods, as well as its potential to disrupt the grocery market. Go figure!